FMW was retained to manage the relocation of Louisville & Nashville Railroad caboose No. 136, the namesake railcar of Bellevue’s “Red Caboose Park.” As part of an ongoing, master plan revision, Metropolitan Nashville Parks sought to relocate the caboose onto a new, concrete pad. FMW’s work began with supplying sufficient lengths of rail to form the support structure for the caboose at its new location. Once delivered and installed by FMW, final attention was paid to finalizing the move planning. On the morning of March 12, FMW worked with two local heavy rigging and transport companies to lift the caboose onto a heavy duty trailer. The caboose was then posed for a brief news conference, before being transported across the park and placed onto its final resting place in the new pavilion. FMW was honored to oversee such an intricate portion of this project, and it was our pleasure to see that this work was completed on-time and under budget. FMW Solutions LLC (FMW) was retained by Historic Watertown, Inc. (HWI) to manage the removal and transport of a 110 foot long turntable from Atlanta, Georgia, to Watertown, Tennessee. The turntable was graciously donated by CSX Transportation to HWI for preservation and installation in support of excursion trains operated by the Tennessee Central Railway Museum and, in the future, by the Nashville Steam Preservation Society. With a very tight timeline, FMW collaborated with heavy lifting and transport firm Mammoet to undertake the move. FMW handled the railroad coordination, turntable disassembly, and overall project management, while Mammoet oversaw lifting and transport of the turntable. Working hand-in-hand, Mammoet and FMW disassembled, lifted, and transported the turntable and associated hardware from Atlanta to Watertown in just a few short weeks. The turntable was delivered to Watertown in early January 2019, and its installation for use by the railroad and preservation groups is scheduled to take place in the coming years. 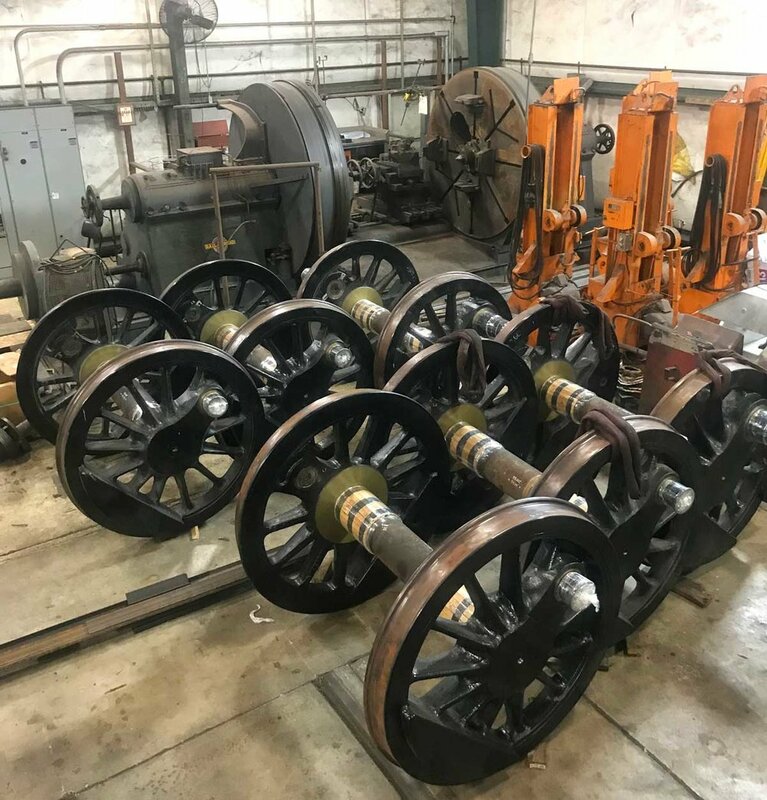 FMW Solutions LLC (FMW) was engaged by Diversified Rail Services to undertake specialized machining work on the six driving wheelsets of C&O steam locomotive No. 1309, a 2-6-6-2 locomotive built by the Baldwin Locomotive Works. The 1949-built Baldwin was recently acquired by the Western Maryland Scenic Railroad, and it is being returned to service as Western Maryland No. 1309 (WM 1309). FMW was tasked with three main pieces of work: 1) re-profiling the axle journals: 2) re-profiling the wheel hubs; and 3) quartering the crankpins. To accomplish the re-profiling of the axle journal surfaces and the hub liners, FMW first had to work with the Tennessee Valley Railroad Museum to return the journal lathe to like-new condition. Working off of an original set of drawings, FMW oversaw the repair to key hardware to return the machine to proper tolerance. Once the journal lathe was repaired, FMW VP-Mechanical Shane Meador re-profiled all of the axle journal surfaces and hub surfaces to true condition. As part of the hub surface repairs, FMW also identified a crack in one wheel center casting. This was repaired using industry-standard repair practices, including grinding out the crack and re-building with weldment and proper peening to de-stress the repair. FMW then turned to quartering the crankpins. Employing a specialized crankpin quartering machine, FMW’s Meador machined the crankpins to in-quarter and stroke tolerances. Since steam locomotive crankpins are set one quarter turn (90 degrees) apart from one side of a locomotive to the other, it is critical to ensure that these pins are precisely 90 degrees apart - wear and tear can result in the engine working its way out of quarter and stroke. Employing the quartering machine, FMW returned each wheelset from WM 1309 to tolerance. Once all of the machining was completed, FMW protected all machined surfaces with rust inhibitor and wood protective covering prior to arranging and handling the shipping of all six wheelsets to the WMSR shop complex in Ridgely, West Virginia. FMW VP – Engineering Wolf Fengler, MSME, has been responsible for undertaking Form 4 calculations of some of the largest steam locomotives operating in the preservation era. He was approached by the Pennsylvania Railroad T1 Steam Locomotive Trust in 2016 with the opportunity to be the lead designer of the engineering team associated with building the new boiler for the 4-4-4-4 Duplex locomotive, which is the largest new-build locomotive boiler project undertaken since the end of the steam era. Fengler began work by re-engineering the boiler barrel for fabrication using modern welding techniques (the original design was of riveted steel construction). This included parallel iterative efforts studying original blueprints, creating 3D CAD models of boiler components in SolidWorks, and calculating stresses per ASME and FRA requirements. Once the design of components were satisfactory, he produced construction drawings from which a selected boiler contractor could begin work. Of particular importance as it pertains to PRR boilers is the design and fabrication of the Belpaire firebox, including the inner and outer knuckles and the thickness of the sheets themselves. The “Form 4” calculation, as it is referred, requires that the boiler be designed with at least a safety factor of four. Original PRR designs did provide for such a factor of safety, but often it was with a very small margin for corrosion. The design work undertaken for the PRR T1 Trust included verification and modification to the original design to improve the factor of safety and, thus, longevity of the boiler. 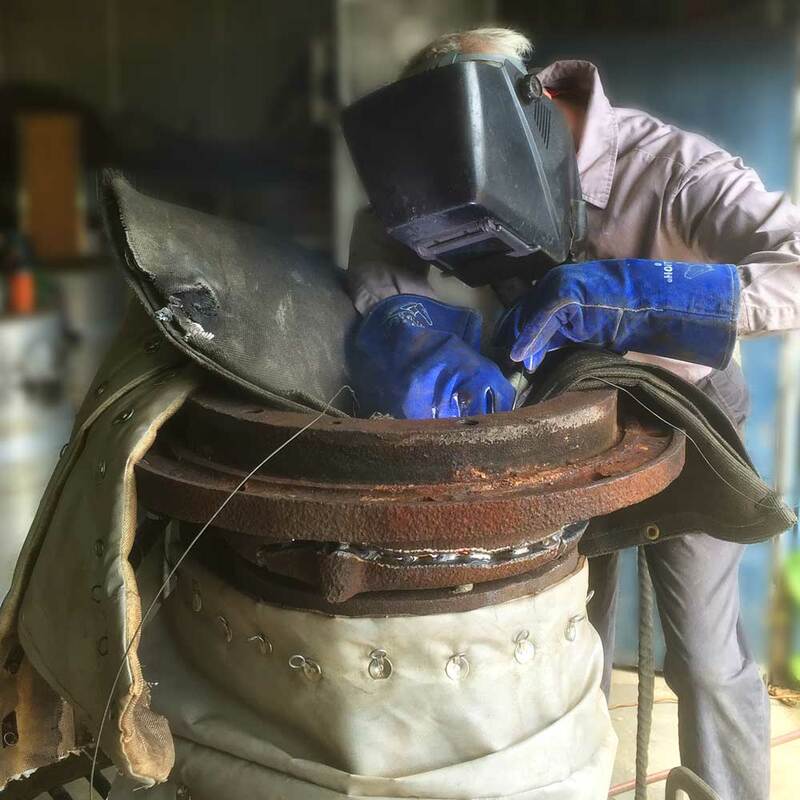 Staged fabrication work on the cylindrical barrel courses commenced in early 2018. Offloading the damaged locomotive truck at FMW’s machine shop - the donor trucks can be seen at left. FMW was retained by GE Power, of Schenectady, New York, to assist it in returning a 110-ton center cab switching locomotive to operational condition. The locomotive had been damaged during shipment to GE, resulting in damage to the traction motor support bearings, journal surfaces, and gearbox. Returned the truck to GE, and commissioned the locomotive. The locomotive was taken out of service on a Thursday and put back into service by the following Monday, including both lifts, to minimize downtime at the facility. Our clients are often surprised to hear that broken cast iron castings can be repaired by weldment - but with proper material selection and preparation, FMW has honed a process that can effectively repair cast iron pieces. As a point in case, FMW was recently hired to perform repairs to a large cast iron steam locomotive blast stand. The cracked assembly was shipped to FMW’s welding facility in Chattanooga, Tenn. FMW oversaw and completed the repair. Our time-honored process melds the combination of proper welding electrode selection with proper material heat treatment. The repair work FMW oversaw saved our client significant time and expense, saving the need to fabricate, or cast, a replacement blast stand.